Enjoy the informal hospitality of the Pietkainen family at one of Lapland’s oldest wilderness hotels. Harriniva lies in the beautiful rolling fells of Western Lapland, where the hills and the forests typify a landscape untouched for thousands of years. 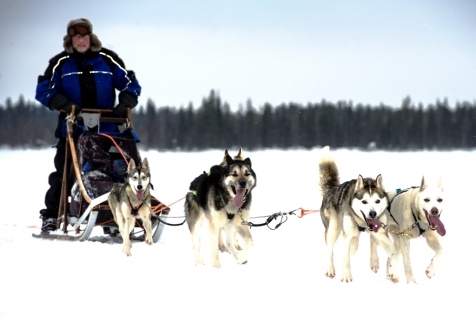 Thrill at mushing your own huskies, take an exhilarating snowmobile ride and journey in a traditional reindeer sleigh. All this set against a backdrop of a wild, rugged beauty, where a lack of light pollution enhances the natural phenomenon of an Aurora Borealis show. 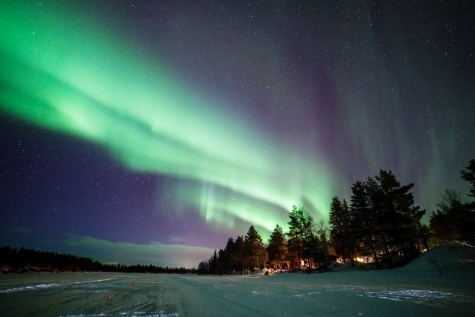 Fly to Kittila (via Helsinki), located in the heart of Finnish Lapland. Transfer to Harriniva Wilderness Lodge, your home for the next 4 nights. Dinner served in the hotel restaurant. After breakfast, walk the short distance to the husky farm to meet the baying dogs. Meet your team, who are all keen to commence their morning run. 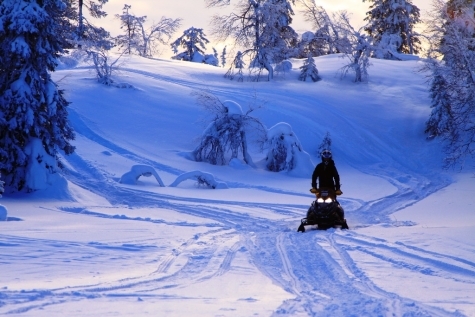 With two to a sled, you will take it in turns to mush and be a passenger on this exhilarating 17km tour through the snowclad forest, before returning to the hotel for a relaxing sauna and dinner. Enjoy a leisurely breakfast before a day of independent snow fun or the opportunity to book an additional excursion. Kick sleds and toboggans are readily available for you to enjoy or walk to and cross the border into Sweden. Later that evening, transfer a short distance by mini-bus to Torassieppi Reindeer Farm, Finland’s oldest reindeer corral. A local reindeer herder will take you on a mystical safari through the night forest. Enjoy the ever changing colours of the Arctic sky and if you are lucky the amazing Northern Lights overhead. This morning is at leisure. Why not master the simple art of cross-country skiing or snow shoeing, both taking you out into the beautiful surrounds. After lunch, meet your guide for a briefing on how to drive your snowmobile. Riding in pairs and taking it in turns to drive, this 30km journey takes you through the frozen forests and mires that symbolises the perfect fell scenery of this area. Return to the hotel for a celebratory aperitif and dinner. Enjoy breakfast at the hotel before your transfer back to Kittila airport for your return flight home to the UK (via Helsinki). Harriniva Wilderness Lodge stands alongside the frozen Muonio River, marking the border between Finnish and Swedish Lapland. Here, the Pietikainen family have offered hospitality for over 25 years to travellers, fishermen, skiers and adventurers. 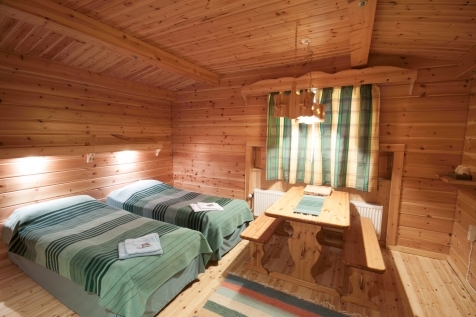 Comfortable and versatile accommodation includes 46 pine-clad rooms, all with private WC/shower. In addition, there are 6 larger rooms with private saunas and 12 duplex, apartment-style rooms, ideal for larger families. 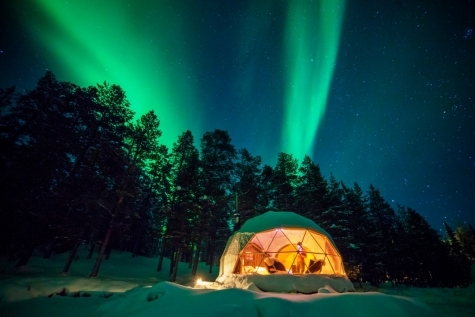 Close by are Harriniva’s latest innovation, a small intimate snow hotel and Aurora Domes. Harriniva’s cosy bar offers a warm welcome after the day’s exertions with coffee/tea and snacks served throughout the day. The lively restaurant has a wide choice of meals, and successfully combines local specialities with international cuisine, whilst the sauna is a perfect place to relax and recharge. Harriniva is also home to the largest Siberian husky breeding kennels in Lapland. Situated a short walk from the lodge, the 400-strong pack are lovingly reared and all individually named. A tour of the farm often includes a visit to any new additions to the fold. Just a short transfer away, is Harriniva’s very own small intimate snow igloo, which also boasts a small ice restaurant and ice bar and winter activity park. Spend a night here in your own snow room, adorned with ice art. Even though it could be -30c outside, inside the temperature remains a steady -5c and the warm reindeer skins, thick sleeping bags and hot juices ensures a comfortable and cosy stay. Privacy in the ice rooms is protected by a curtain. Shower and WC are situated in a separate block. Escaping into the surrounding wilderness, with no light pollution offers the best opportunity to view the northern lights in all their glory. This 2 hour snowmobile safari takes you to the top of nearby fell, where the starry skies and landscape stretch before you. Enjoy warm drinks as you scan the sky for the northern lights. It does not take long to master the art of snow shoeing and after a little practice, you will soon be travelling through deep pristine white snow to a spot to the north of Harriniva where, if the aurora appears, you will be rewarded with some spectacular views. Hot drinks and equipment included. Take a short transfer to Harriniva’s sister hotel, Torasseippi where eager huskies will be waiting for their evening run. After instruction, drive in pairs into the night. Even if the northern lights do not appear, this is a magical experience, as you follow the twists and turns of the tracks through the forest, silent except for the panting of the dogs and swoosh of the sled runners on the snow as it glistens in the moonlight. Head out by mini-bus in search of the northern lights. Your expert guide will have checked the latest forecast and head to the nearest hot spot. The trip could take you across the border to Sweden. Hot drinks included. It can be said that the Finn’s are born with ski’s on their feet, and cross-country skiing is a national past-time. There are over 250km of tracks in the Harriniva area and your expert guide with teach you the basic skills required so that you can hit the trails.